THE FACTS: Born in Osaka, Japan. Bachelor of music from the Curtis Institute of Music. Prior to the Philharmonic: concertmaster of the Malaysian Philharmonic and of the Curtis Symphony Orchestra. At the Philharmonic: Joined May 2016. EARLIEST MUSICAL MEMORY: My second recital, when I was five. When I finished playing, I felt the room’s energy turn into joy. For years I wondered why these sounds I learned to produce led to such warm waves of affection and adoration from my family — why I would receive flowers, why my daddy would hug me and point to his teary eyes — but it brought me the most simple, raw joy. That child’s joy is something I will never grow out of. WHAT LED TO YOUR APPEARANCE IN THE PBS DOCUMENTARY VIOLIN MASTERS: TWO GENTLEMEN OF CREMONA? When I was a teenager, my teacher introduced me to his good friend Dr. David Fulton, a violinist and collector of fine Cremonese instruments, who happened to live several houses away. He let me play every one of his precious, legendary violins and bows, all in pristine condition and each with an incredible history of former masters like Menuhin, Ysaÿe, Szeryng, Perlman. That was a once-in-a-lifetime experience on its own, but then he invited me to perform for the documentary and casually asked me which instrument I would like to take to prepare! I was speechless. I picked the “Baron Knoop” Stradivarius because it felt most approachable and similar to my own violin. TELL US ABOUT ORCASTRA, THE ENSEMBLE YOU FOUNDED THAT HAS RAISED TENS OF THOUSANDS OF DOLLARS FOR TSUNAMI VICTIMS IN JAPAN AND FOR THE IMPOVERISHED IN TANZANIA AND GUATEMALA: I chose charities with a personal connection because I felt it would mean more to us performers and to the audience. 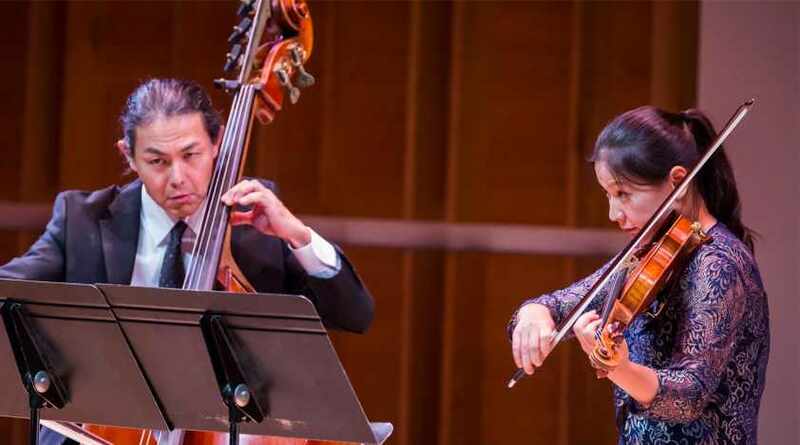 For example, my sister and one of the Orcastra violinists went to Guatemala to help out at a refuge, so we organized benefit recitals for the refuge that featured the two of them playing. The ensemble is named after orca whales, my favorite animal. As a youngster I wanted to become an orca scientist. There are currently more than 70 orcas — stuffed animals, pottery, jewelry, books — in our tiny apartment! ARE THERE OTHER MUSICIANS IN YOUR FAMILY? My husband, whom I met at Curtis, is a trombonist. My dad is a financial consultant, my mom is a freshwater biologist, and my sister is a medical student and pole vaulter who plays piano as a hobby. WHAT DO YOU DO IN YOUR FREE TIME? I love swimming long distances. My husband and I adore hiking, backpacking, and connecting with nature, especially in the Pacific Northwest, where I grew up. I enjoy logic and crossword puzzles and treasure outlets for spontaneous bursts of creativity — artwork, deep conversations, and creative problem-solving. Right now I’m reading Schoenberg’s Structural Functions of Harmony.